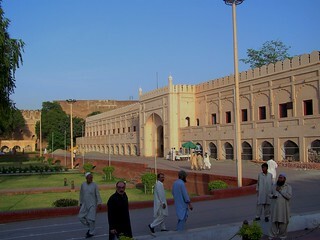 The "Roshnai Gate", also known as the "Gate of Lights", is located between the Lahore Fort and the Badshahi Mosque. As the gate was one of the main entrances into the city, it was constantly visited by Omerahs, courtiers, royal servants and retinues. In the evenings the gate was lit up, hence its name. The gate was also referred to as the "Gate of Splendour". It is the only gate that is in good condition and still retains its original looks.